An international team of researchers has developed a drug delivery technique that utilizes graphene strips as “flying carpets” to deliver two anticancer drugs sequentially to cancer cells, with each drug targeting the distinct part of the cell where it will be most effective. The technique was found to perform better than either drug in isolation when tested in a mouse model targeting a human lung cancer tumor. The researchers also found that an anticancer protein, TRAIL, can serve as an active targeting molecule to bind directly to the surface of cancer cells, which had not been demonstrated previously. The work was done by researchers at North Carolina State University, the University of North Carolina at Chapel Hill, and China Pharmaceutical University (CPU). In this study, the researchers attached two drugs – TRAIL and doxorubicin (Dox) – onto graphene strips. Graphene is a two-dimensional sheet of carbon that is only one atom thick. Because TRAIL is most effective when delivered to the external membrane of a cancer cell, while Dox is most effective when delivered to the nucleus, the researchers wanted to deliver the drugs sequentially, with each drug hitting a cancer cell where it will do the most damage. “These drug-rich graphene strips are introduced into the bloodstream in solution, and then travel through the bloodstream like nanoscale flying carpets,” explains Dr. Zhen Gu, senior author of a paper describing the work and an assistant professor in the joint biomedical engineering program at NC State and UNC-Chapel Hill. Once in the bloodstream, these flying carpets take advantage of the fact that cancer tumors cause nearby blood vessels to leak by using those leaks to penetrate into the tumor. The researchers tested the flying carpet drug delivery technique in preclinical trials against human lung cancer tumors (cell line A549) in laboratory mice. 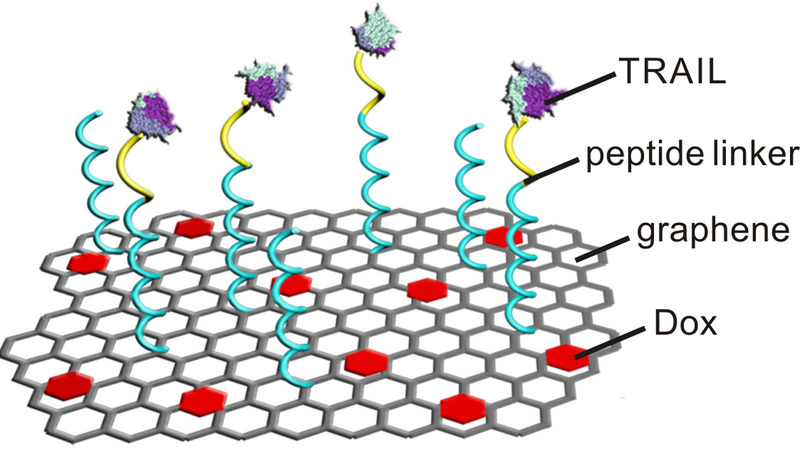 The technique was significantly more effective than Dox or TRAIL by themselves, or to a combination of Dox and TRAIL in which the peptide link between the graphene and the TRAIL couldn’t be severed. The paper, “Furin-Mediated Sequential Delivery of Anticancer Cytokine and Small-Molecule Drug Shuttled by Graphene,” was published in early view online Dec. 15 in Advanced Materials. Lead author of the paper is Dr. Tianyue Jiang, a former graduate student in Gu’s lab who is now on faculty at Nanjing Tech University. The co-corresponding author is Dr. Ran Mo, who is also a former postdoctoral researcher in Gu’s lab who is now on faculty at CPU. Co-authors include Wujin Sun, a Ph.D. student in Gu’s lab; Qiuwen Zhu, a Ph.D. student at CPU; Nancy Burns, a Ph.D. student at NC State; and Dr. Saad Khan, Alcoa Professor of Chemical and Biomolecular Engineering at NC State. This research was supported by the North Carolina Translational and Clinical Sciences Institute under grant number 1UL1TR001111 and with funding from NC State and UNC-Chapel Hill. Abstract: A cellular protease (furin)-mediated graphene-based nanosystem is developed for co-delivery of a membrane-associated cytokine (tumor necrosis factor-related apoptosis-inducing ligand, TRAIL) and an intracellular-acting small-molecule drug (Doxorubicin, DOX). TRAIL and DOX can be sequentially released toward the plasma membrane and nucleus, respectively.